INTERESTED IN STOCKING MONJAY MEZZA PRODUCTS? 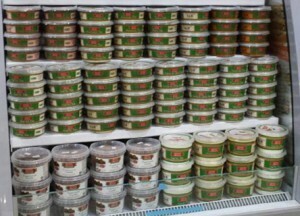 Monjay Mezza is a producer of delicious Mediterrean Dips and Finger Foods. Based in Sydney, Monjay Mezza deliver throughout Australia, shipping weekly via road and air, using trusted delivery professionals. Just wanted to say thank you and kudos for making the best hummos in the world. It makes my otherwise mundane morning tea of carrot and celery sticks super yummy. I will make sure I spread the word. Keep up the good work. I bought some of your dips from my local corner store in Cronulla, and i wanted to write to tell you i am very impressed. They are delicious. The fetta and olive is just incredible and the tzatziki is very good too. I have enjoyed them much more than dips i've bought in the big stores. They are really very very good. I recently tried your garlic dip and I am a huge fan! It's fantastic and hands down the best garlic dip I have ever tried. When ever I am in Sydney I always purchase as much as will fit into my caravan fridge to bring home to Qld, my kids have now discovered that they love it as well so this cuts into my supply! I purchased some of your Garlic Dip from a place in Sydney, and I must say it was absolutely beautiful.